“I was diagnosed with breast cancer in May 2015. Then I found out I was HER-2 positive, a generally more aggressive type of breast cancer which put me in a higher risk category. 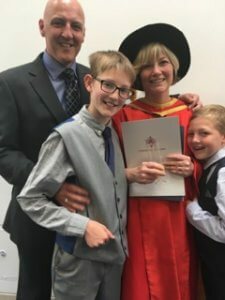 Emily at her recent PhD graduation with her sons Liam and Rhys and husband Hedley. Thankfully the cancer was caught early and hadn’t spread. I had a lumpectomy followed by five months of chemotherapy and six weeks of radiotherapy. I’m still taking Tamoxifen. It’s so exciting to know how much researchers are learning about breast cancer. I’m particularly interested in the research that Cancer Focus NI is funding at Queen’s which looks at how cancer develops in your second breast. While my prognosis is good, I’m a realist and I know that a recurrence is a possibility. It’s a very frightening thought and one which makes this research close to my heart.